Believe it or not, loud, rhythmic sounds like the churn of a washing machine or hum of a vacuum cleaner actually help soothe a tired, fussy newborn. But bulky appliances and cleaning devices don’t exactly belong in the nursery (or wherever you are) when your baby needs soothing. 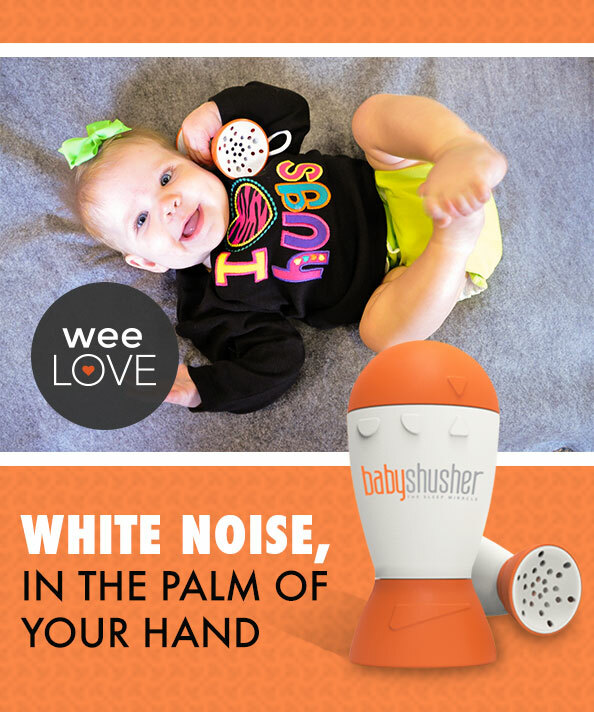 The Baby Shusher is a small, portable sound machine that quickly comforts your little one with a rhythmic shush sound, much like what they were used to hearing in the womb. This doctor approved technique (check out The Happiest Baby on the Block for more details) engages your newborn’s natural calming reflex to help him settle down and get his ZZZs. It’s the perfect size to bring on trips, in the car, or even when you’re out running errands (ya never know when pre-nap fussiness will kick in). Two timer options allow you to play the shush sound for fifteen or thirty minutes. (If you’ve ever tried shushing that long yourself, you deserve more than a pat on the back!) The volume can be easily adjusted, too. Newborns require lots of wardrobe changes… so that washing machine will still be operating at full capacity. But thanks to the Baby Shusher, you can give it a break at bedtime. How can I hear what this sounds like ? There are several video reviews of the Shusher on YouTube where you can hear what it sounds like—hope that helps!